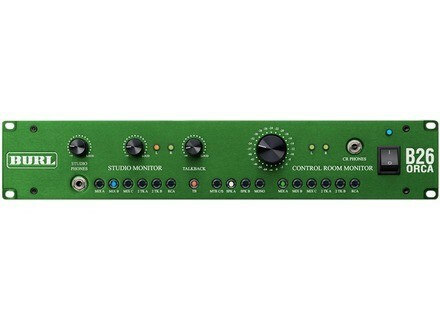 B26 ORCA, Monitor Controller from Burl Audio. Burl Audio has announced the B26 Orca Monitor Control. The B26 utilizes the same analog, class-A circuit path philosophy as prior Burl Audio products, with the emphasis on sonic transparency and 3D stereo imaging. The B26 features: direct coupled, class-A signal path, 3 stereo mix inputs, 2 stereo tape return inputs, RCA stereo input, 2 stereo speaker outputs, 0.1% matched resistor, stepped attenuator for control room level, independent studio/phones send and level, external meter output, control room and studio headphone outputs. MSRP is $2499 for the B26 Orca. [AES] Audio-Technica AT5040 Audio-Technica introduces its AT5040 cardioid condenser mic. [AES] Kush Audio Electra 500 Series Kush Audio unveiled their new Electra, or ‘Electrified Transient Equalizer’, a multi-topology 500 series EQ. [AES] Slate Pro Audio Raven MTX Slate Pro Audio introduces its Raven MTX Multi-Touch Production System at AES.